1947, summer, [[Kiyoshi Sugiyama]], who worked at the ''Central Kyoto News'', took Suma to the editorial office of ''[[Kitan Club]]'' (Akebono Shobo), which gave Suma a chance to begin drawing illustrations for ''[[Kitan Club]]''<ref group="note">There's a conflict in stories between whether ''[[Kitan Club]]'' was founded in 1946 or in October of 1947. A visit will be made this summer to try to confirm the latter.</ref>. 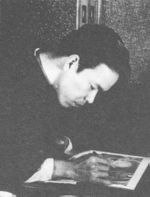 There were other irregularly published pulp magazines besides ''[[Kitan Club]]'', and Suma drew illustrations for ''Jouen Shin-syu'' and others as well.<ref group="note">[[Shizuo Yagi]], who used the alias [[Mineko Tsuzuki]], took over as editor of ''Glamorous New Collection''.</ref><ref name="akita"></ref>. 1962, Suma passed the editorial baton to [[Chimuo Nureki]], who became [[Uramado]]'s new editor-in-chief. Suma worked on editing "Light" and the girl's magazine "Lyric Literature"<ref name="akita"></ref>. 1970, Suma and [[Chimu Nureki]] left Kubo Shoten and founded [[Abu Production]], where Suma was an executive head. They published [[Abument]] which terminated on Sep. 1970. 1970 Nov. Involved in the foundation of [[SM Select]]. 1971 Oct. Involved in the foundation of [[SM Collector]]. 1970's Suma suffered a cerebral aneurysm. Commitment to rehabilitation in Spring Sanatorium in Shichi-zawa, Atsuki city, Kanawaga<ref name="eshi"></ref>. 1989, The documentary video "Jouen - The world of Minomura Kou" was made by [[Syoichi Yoshimura]]. Directed by [[Haruki Yukimura]]. [[Chimura Nureki]], [[Oniroku Dan]], [[Tetsuro Sakuragi]], [[Go Arisue]], [[Yoji Muku]] and [[Syoichi Yoshimura]] appeared on the video.